Battle-hardened Orcs are among the gameâ€™s most powerful infantry units. Goblin Bowmen and the powerful but unreliable Goblin Bomb Chucker provide you with missile fire, and Goblin Wolf Riders are among the fastest cavalry units in the game. You can also bring huge Trolls with you into battle â€“ and just when your opponent realizes how hard it is to damage them, they regenerate! 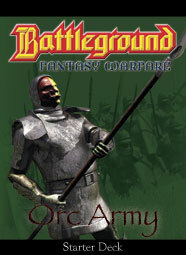 As the Orc general you can Lash your troops into battle frenzy. By spending one Command action you increase the movement of one of your units for the turn and gain an extra attack die. As battle lines break into the chaos of melee, your special ability will allow you to make the most of any opportunities to flank an enemy unit or destroy a routing enemy. Orcs are vicious and aggressive and everything about the Orc army reflects this, from your units to your command cards to your special ability. As general of the Orc army you will keep your enemies constantly on the defensive and no faction is better at turning a break in the enemy line into victory. Skillful (but often cowardly) goblins round out your basic forces and mighty regenerating trolls are an almost unstoppable force. As the leader of the orcish horde you can Lash your troops. For one command action, Lashing a unit increases its movement class by one and gives it an extra attack die for the turn. When battle lines turn into rough melee, this ability will let you take quick advantage of broken formations or routing enemy units, sending your troops in quickly to flank or pinch the enemy.